Express transport provider is in search of a buyer for a large part of its fleet. Barnetts Couriers in Wollongong is selling 67 of its rigid trucks. A Wollongong transport business is divesting a large part of its fleet, inviting expressions of interest for the 67 four and five-tonne rigid trucks. The vehicles – a mix of Hino and Isuzu models – are being sold by Line Haul, which offers contract services to local company Barnetts Couriers. 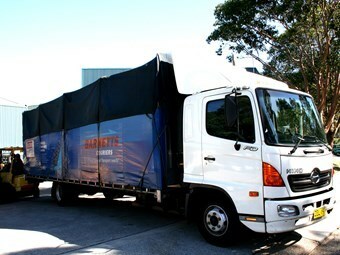 Barnetts offers express transport services between depots in Newcastle, Sydney, Wollongong and Melbourne. It has recently also begun servicing Tamworth. Manager Tony Barnett says each of the trucks features a purpose-built canvas-covered tray top. The fleet is valued at close to $2 million, and can be managed as either a dry-hire business with existing franchisees, or with internal employees. It is not the first time Line Haul’s trucks have been available for sale en-masse. Barnett acknowledges he ran a similar sales campaign in January last year, but later withdrew the fleet from sale. Since then, the number of rigid trucks has grown from 40 to the present 67. Line Haul has also bought a number of prime movers and trailers, but Barnett says these are not for sale. Interested parties are asked to register with Line Haul or Barnetts by October 2.